That seems like an odd statement in itself, but a lot of us need to be encouraged to be more ethical than we think that we are being. Now in the online world, there is affiliate marketing for instance where you earn money, you recommend people’s products and you get a commission. Quite a lot of people don’t mention that they are recommending someone’s product in exchange for a commission. Now of course, they should be recommending it because they are recommending it. It shouldn’t be because of the commission that they are going to receive. Transparency helps. Transparency means you’re telling the truth, obviously. But when you tell the truth, people trust you. People can tell and that’s the odd thing. People can see through you. You may not realize but people can. Here’s an example for you — one that involves my fire protection business. We are producing a lot of videos about our products. Now most of the fire extinguishers in the UK are now made in China, but the UK industry thinks that’s kind of cheap and nasty. They forget that their iPhones, the technology in a TV, and most of the clever stuff is made in China and Taiwan these days and it doesn’t make any difference. Because of that mental block they don’t want to tell people. Now in our videos, we clearly tell people. We are the only ones that has ever admitted it. We explain how the quality is there. We explain how to be careful of cheap Chinese imported products and quality Chinese imported products. There is a difference, but the customers will appreciate that transparency. Another one is on pricing. Most websites and companies will not admit their prices until they’re in front of the customer. We think that the customer will be scared of the prices. I don’t understand why because the customer is going to find out the price eventually. Do you think it won’t scare them when you’re sitting in front of them? The other reason is they think their competitors will find out what the prices are. If a competitor wants to know what the prices are, they simply phone up and ask to get an appointment (which by the way, is a dummy buying exercise). They will find out. Now if you are priced at the higher end, you can say, of course, “We’ll never be the cheapest, however do you want the cheapest? You obviously get what you pay for.” You explain your US fee or use selling props that show whats different about you and what makes you special. But always try to be transparent, ethical, and honest. Like with your terms and conditions — don’t hide things in terms and conditions. If you say, we accept returns, don’t then hide it in the terms and conditions that we will do that but with a 15% restocking charge because your customers are going to find out. Then they’re going to complain. Don’t forget people pull a lot more effort into complaining than complimenting. When they get what they expected, they don’t need to tell anyone but when they don’t– watch out! It will come back to bite you. 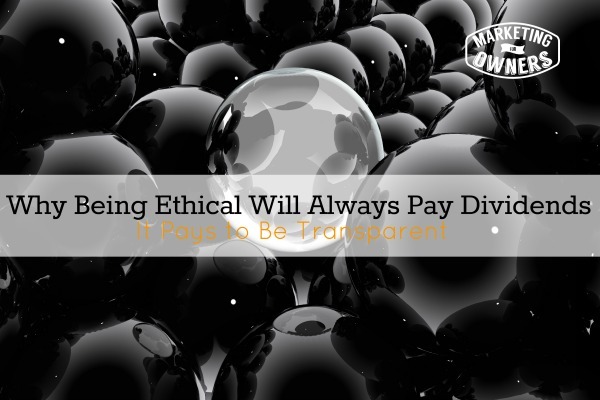 So be ethical, be transparent. Look at your website, look at your material. Is it telling the truth? Are you being upfront with your clients? If you are, you’ll be in the minority. People will trust you. There are a load of examples of how this works. If you want a few examples because you are not sure what I am talking about, email me at info@marketingforowners. Drop me an email. I will give you some great examples of people making a fortune through being honest. Today I have a nice relaxing drive time podcast for you. It’s called the BeanCast. It’s run by Bob Knorpp. It’s pretty much around the table chat and it lasts about an hour each week. This has been going for a long time. It’s incredibly popular. Bob has a really high reputation and gets great guests to come on and it’s enjoyable. It’s fun. They always have fun. 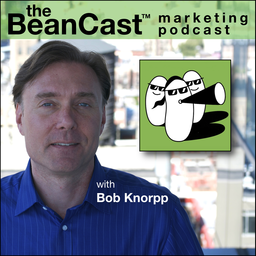 They talk about modern marketing, social media and all the things that we’re interested in. It’s very relaxing. Sometimes we need to, while we are learning, to just relax a bit. So go check out the BeanCast podcast. I think you’ll like this one. Also by the way have you subscribed to the Marketing for Owners podcast yet? are you actually subscribed? It’s on iTunes. Please subscribe. Please add a rating and give us a review. What needs an update to be more ethical on your website?